There are no defined rules for asking folks to volunteer for Tattoosday, but I have alluded to some personal guidelines, like the reluctance to interrupt people who are talking, or my tendency to select individuals who are stationary and generally alone. I have also said I will not follow people. Too creepy, generally speaking. However, when something spectacular presents itself, all bets are off. Friday morning, around 11:30 am, I was facing North on the southwest corner of 34th Street and 6th Avenue, on the outskirts of Herald Square, when I saw a heavily-tattooed woman across the street, walking with a guy, heading West. When the light changed, I had already decided to go take a closer look. Although not a completely finished back piece, it was breathtaking, especially if one admires quality ink. Click on the photo to enlarge. She also had tattoos running on both arms as well, neither of which I photographed. I did my basic introduction and she was immediately receptive. Her name was Jill and she hailed from Nebraska. After agreeing to participate, I asked her to offer me a piece that she felt most sentimental about. She had a hard time answering. I elaborated, "What one do you have the best memories about?" She selected the one I would least likely have chosen, but I was thankful that she was letting me add her to Tattoosday. At the top of her right foot, at the bottom of the leg, she had the word "Rad" tattooed. Jill explained that she and five friends had gone out together and each had a word inscribed on them permanently. The memory of the event clearly had an impact on her. When I asked "Why RAD?" She shrugged, "It's just a word I liked. One of my other friends had gnarly tattooed on her neck." The tattoo was done in Omaha, Nebraska at Liquid Courage Tattoo and Piercing by the artist Jason Brown. She said technically she only had 6 tattoos in all. She counted her 2 sleeves as one apiece. And I'm guessing she counted the back as one whole as well, despite the many components. Well, I didn't want to take up too much of her time, standing in the sidewalk. In fact, while chatting with her, a couple stopped and the woman complimented her on her tattoos. With art like this, I'd imagine she gets that a ton! I asked if I could take a shot of her back, she agreed. I thanked her and ambled off. I did notice when I uploaded the photo to the home computer later that the back piece still needs a little coloring which might be why she didn't offer it up right away as the tattoo I should photograph. Of course, I want to dwell on the back a little longer. The script states "Traveler to the Grave". 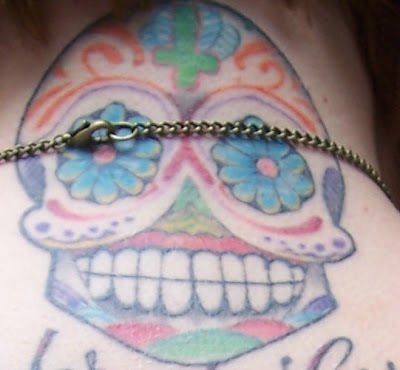 I also love the image on the neck, which is traditionally known as a calavera, attributed to the Dia de los Muertos, or the Day of the Dead in Latin American cultures. The heart on the left side of the back is, I am surmising, a tribute to her grandfather. The strap of Jill's top covers up the first date partially, but I am leaning toward 1927-2004 as the span at the bottom of the heart. Thanks to Jill for so kindly sharing her art with me! If you're reading this, Jill, and feel like sending me any shots of your sleeves, feel free to e-mail me. I hope you had a wonderful trip to New York City. Thanks for brightening my day! but she was traveling with two friends. I have a harder time approaching people in pairs or groups, for some reason, perhaps because I fear not the rejection of one person but of two or more. Imagine: I approach a person and ask them about their tattoo. Their friend shoots them a "Who is this dork?" look and the tattooed is less likely to be forthcoming about their art. I also don't like to intrude on conversations and/or stop people who are moving. It's a courtesy thing, I guess. Although, if someone is sporting an incredible tattoo, I may suspend these "rules" for a shot of an amazing piece of body art. So there I was, walking uptown, thinking it will likely not be the day for the Black Flag ankle tattoo, when I spotted a guy leaning up under a scaffolding. He had ear buds in and was reading, but his tattoo was interesting enough that it was worth disregarding those two deterrents. Now, wouldn't you say that's fairly unusual? I just had to get to the bottom of this one. Before you continue, click the photo to see it in greater detail. It blurs a little, but you get a better idea of the full piece. This tattoo resides on a guy named Losie, a resident of New Jersey. I introduced myself and he was very receptive, removing his ear buds and speaking very openly about his tattoo. This was his second tattoo (more on #1 later). It originated from his finding the art of Greg Simkins online at his website IMSCARED.com. 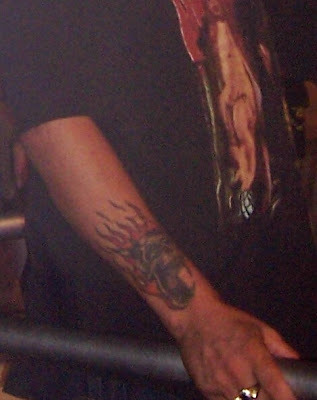 The tattoo was then inked by Damion Ross at New York Adorned in the East Village. So why did he choose this artwork for himself? "It reminded me of having nightmares when I was a kid," Losie related, "The kid is me." Greg Simkins seems like a perfect match, then, for Losie's nightmare motif. If you look at his site, you can peruse dozens of his paintings, sketches, and drawings and they all resonate with a sense of the macabre, depicting spectacular, colorful visions of an imaginary world in which rabbits are terrifying and inanimate objects come to life. 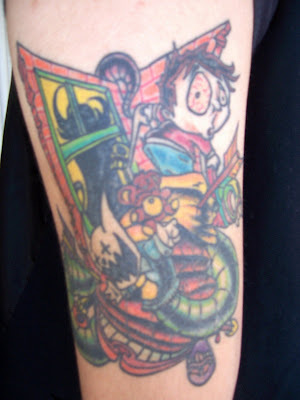 Losie definitely has a fascination along the same lines, and indicated that he would eventually like to have an entire sleeve dedicated to the horror genre. I asked him about the tattoo on his other arm, he indicated it was done at a shop in Burbank, California, where he had lived for a couple of years. The tattoo is the logo for the band Coheed and Cambria. 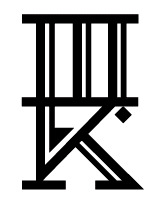 Interesting, I was following a Black Flag tattoo and found a Coheed & Cambria one instead. Losie explained the bats around the logo as a reference to an ex-girlfriend. He elaborated, "Her name was Jamie, so I added five bats, because Jamie has five letters in her name." "See the purple skull coming out from under the bed?" "That's for my ex-girlfriend Violet." Do note, all quotes are approximate and may not be 100% accurate. I took notes but did not write down exact statements. The messages, however, are accurate. Losie did allude to a third tattoo, on his stomach, but we didn't discuss the exact location, or what the piece consisted of. Thanks again to Losie for his participation! This post, originally called "Twenty-two Tattoos" has been revised. I ran into a woman from Boston named Lindsay in front of Madison Square Garden on Monday, September 24, and she let me photograph three of her 22 tattoos. Alas, it was a bright, sunny day and the shots were awash with light and did not do the body art justice. I appealed to Lindsay here and she answered my call, sending me much better shots, and an extra one to boot. So, thanks again, to Lindsay. So I didn't take these specific photos, but I gave it a try. The end result is the same, I hope: an interesting post about some great tattoos. What struck me about this was its color. 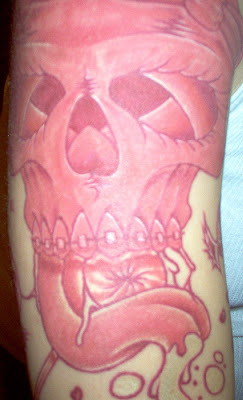 You see a lot of skulls in tattoo art, but they're seldom this shade, a pink that illuminates off of the skin. This was inked by Spiro at Superchango Tattoo Studio, just north of Houston in The Woodlands, Texas. Spiro is not listed on the shop's site currently, but his home page on Inked Nation here still shows an affiliation. One of the things I ask people with multiple artwork when I meet them on the street, since I can't very well photograph everything on them, is what piece means the most to them. In Lindsay's case, it was a chest piece that was still a work in progress, so she offered up "Maggie," as she called her. Lindsay explained that Maggie was an original piece created by Spiro based on a painting he had done for a tattoo convention. Maggie is unusual because most of Lindsay's work she designed herself. Maggie is an anti-drug tattoo, Lindsay explained. 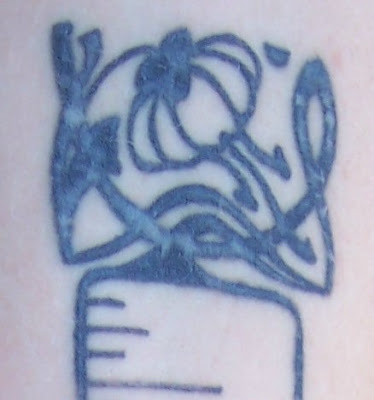 It's not visible in the tattoo but, off to the left, there is some additional work that she had Spiro add, like pills, a syringe, and other drug-related designs. Maggie represents what a life of drugs could produce. Lindsay wears Maggie as an anchor, a reminder of what could result from unhealthy choices. When I asked about it, Lindsay explained that she is creating a series of tattoos dedicated to her five senses, which she feels extremely connected to. Each sense is artistically represented with a different type of wings. This blue and yellow hand, on the outer left forearm, was barely visible in my attempt to photograph it, and represents the sense of Touch. This one is credited to Dave Boseman at Superchango. Lindsay explained that "Sight" was done at a tattoo convention in Rhode Island. And I took the chance to add another one of mine...that I didn't think to show you. 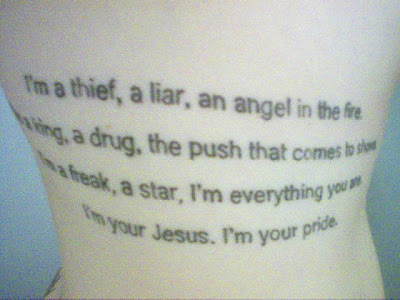 It is the chorus to my all time favorite song. Also done by Spiro at Superchango. The song "Made to Heal" appears on Our Lady Peace's album Spiritual Machines. The photo file name is entitled "Ribs," so I will assume that is why I didn't see this tattoo. I'll see if Lindsay can clarify that for me. Thanks to Lindsay for her cooperation on this post and her willingness to share. That's what she called it, her "tattool". Robin is in New York City working an internship as a Costume Designer on Broadway. 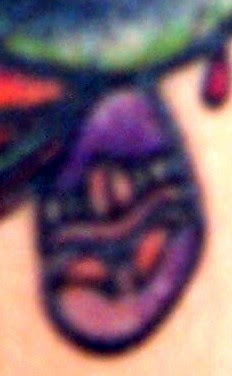 She had attended the Art Institute of Chicago and obtained this tattoo there in the Windy City. 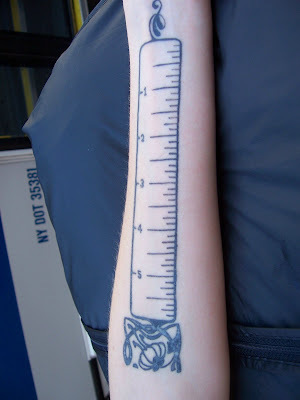 "I was tired of constantly looking for rulers," she mused, so she had one inked on. "It's to scale," she beamed, "My tat-tool". Definitely one of the most practical tattoos I have ever seen. This piece was created by Allie at Tatu Tattoo in Chicago. she indicated that she has a twin sister with the exact same symbol on her neck. She was tentative about where, exactly this was done. Originally hailing from Eugene, Oregon, she thought it might have been done at High Priestess in her home town. She threw in a disclaimer that High Priestess might be only a piercing shop (it apparently is), so we're not sure exactly of the name of the shop where this interesting piece was tattooed. Nonetheless, Robin was an interesting person to meet, very friendly, and the possessor of a very cool tattoo that serves as a measuring implement as well. Thanks to Robin for her willingness to participate in Tattoosday! The following excerpt comes from this past Sunday's (9/23/07) popular "On Language" column by William Safire in the New York Times Magazine. Regret about the permanence of skin illustration is rising. The Washington Post reported that a Harris Poll a few years ago indicated that nearly half the young women between 18 and 29 surveyed had at least one tattoo, and that 17 percent of all tattooed Americans who had tattoos regretted getting them. It seems that many of the aging former teenagers have had a skinful. Etymology of the dermatology: Earliest use I can find of nostalgia for an unmarked epidermis is a headline above a 1989 Times column by Lawrence K. Altman, M.D. : “For Those With Tattoo Regret, Here’s Hope.” Back in that day, laser treatment was the great hope; now it seems that a new tattooing ink has been developed that, it is claimed, may make removal of tattoos by laser more practical. Tattoo regret is formed on the analogy of buyer’s regret, more vividly and widely expressed as buyer’s remorse. Until this collocation was formed, the idea took longer to express, as in this 1891 citation from a San Antonio paper: “They who bought winter hats . . . early in the fall are now repenting their rashness at leisure.” The same anguished repentance happened this year to early buyers of Apple’s hotly touted iPhone, who plunked down $600 only to find the item reduced to $400 a couple of months later, lowering the puissance of the status symbol. In 1957, Leon Festinger came up with a theory of “cognitive dissonance,” in which he posited the opposite of buyer’s remorse: Most of us tend to embrace the choice we make, so as to reduce the self-critical dissonance in our minds. When we buy a Ford, we read Ford ads and shy away from reading the ads of Toyota. The regret or remorse combining form has an immediate future in politics. As the states play backward leapfrog with their primaries, we face a stretch of nine months of campaigning leading up to the national parties’ conventions next summer. As the political winds blow hot and cold, as candidates’ poll ratings rise and fall after each statewide election, primary voters and contributors will experience a kicking-oneself feeling when their candidate fades and they wish they had chosen the victor to oppose the other party’s choice. And what will we call that sinking sensation felt by all the primary voters who failed to back the winning candidate of their party? Those afflicted with tattoo regret will have company: as we plod through the primaries, watch for voter’s remorse. When I moved to New York in 1997, one of the first friends I made at work was Janet Loder (now Loder-Berthelon). Even though Janet left for greener pastures almost five years ago, we still talk and occasionally get together for lunch or a social jumble of offspring (i.e. our kids play together). Last Thursday, we met at lunch and Janet let me take some hasty shots in the sunshine of her three tattoos. All pictures were snapped on the steps of the New York Public Library, between Patience and Fortitude. This pachyderm has been touched up twice in the twenty years or so since first decorating Janet's right shoulder blade (aka the posterior scapula). It was the first tattoo I saw on Janet, back in 1997 when tattoos were not as common as they are today. Janet has always loved elephants, and has a few collected, the first of which was given to her as a child by her much-beloved Aunt Claire, for whom her daughter is named. Janet's love of elephants (and hence her tattoo) stems from their being majestic creatures that are matriarchal and intelligent. They are social beings that even mourn for their dead. This simple yin and yang symbol, inscribed on the left side of her lower back, was added in the East Village, we're guessing at Andromeda Tattoos Studios. It is a symbol, for Janet, of her striving for balance in her life. Janet is particularly proud of this one and thinks it has the best story of her three tattoos. I would agree. She had this done in 2004 when she had been traveling a lot on business between New York, San Francisco, and Los Angeles. She began dating a guy in L.A. and was seeing him whenever she flew into town for work. As her California work projects came to a close, their relationship reached a crossroads, and there was discussion and soul-searching over the matter of relocation. He didn't want to leave L.A. Janet was born and raised in Buffalo and is a New Yorker through and through. I can't imagine her living in L.A. And neither could she. As one might guess, her decision was solidified when she went and had this tattoo done which, "sealed the deal not to move to L.A." Once branded, she mused, there was no way she was leaving New York. Thanks to Janet for sharing her tattoos and accompanying stories! You know a friend is true when they'll let you blog about their tattoos! After he successfully completed chemotherapy and radiation, and survived this scare (I still sport a yellow "LIVESTRONG" wristband in honor of him, despite the fact that they are "out of style"), he felt that the metaphor of the comedy and tragedy masks best represented his struggle. To him, the tattoo represents life. It is a badge of survival, and a reminder of the importance of humor in the face of the most dire of circumstances. I was only on the sidelines when David struggled. But through it all, he managed to maintain a strong sense of comedy. His sense of humor took a beating, but it never gave up, and it sustained him and let him remain positive. He acknowledges that that attitude had a place in the battle for his life. The tattoo is discreetly located on his left calf. I say discreetly, because David is not one to wear shorts. I have always seen him in slacks or jeans, but never shorts. He doesn't recall specifically where he had this inked, other than a shop in SoHo. Thanks, David, for sharing your tattoo! 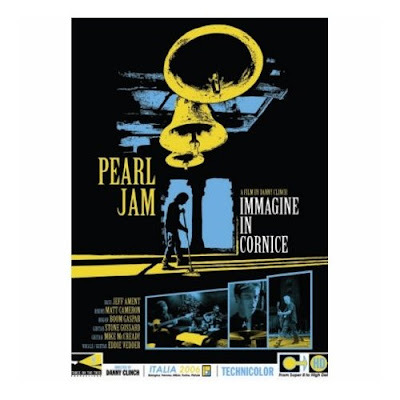 Pearl Jam is releasing a DVD of concert footage from last year's tour as it passed through Italy. 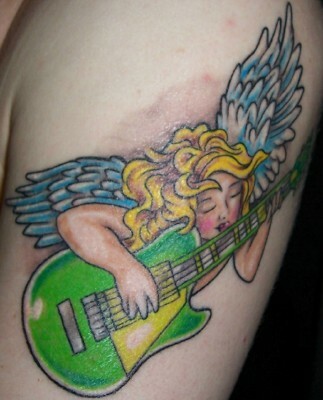 Their fan site has a clip from the video, in which guitarist Mike McCready discusses his tattoos. Check it out here. Ever since I started blogging tattoos, I like to carry a folder with printouts and my camera with me, wherever I go. So on Wednesday night, when I realized I had until midnight to return a video to Blockbuster (Rescue Me, Season 2, Discs 1-3, all unwatched) or face stiff penalties, I dragged my stuff with me, just in case. At that time of night (11:30 PM), I figured opportunities would be slim to none. Let me clarify, I saw some cool tattoos, but figured it would not necessarily be the best idea to ask bar patrons out of the blue on the street to participate. Anyway, video returned, happy with just a shot of a new look from The Loneliest Lamp Post in Bay Ridge, I walked past, near the stroke of midnight, a harmless looking gentleman unchaining his bicycle . At first glance, he looked like he had a bicycle tattoo on his right forearm. Well, obviously, he agreed to participate in Tattoosday. So, what is this? Matt is a resident of Williamsburg, but works in Bay Ridge. In retrospect I marvel at his midnight bike commute, although I hope he just rides to the nearest train station. 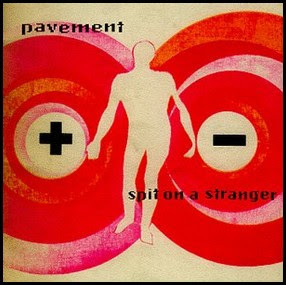 Matt's tattoo was adapted from the Pavement EP, which was one of the band's final records. He says he gets a lot of comments and questions about it, and that people interpret it differently, yet all seem to be in the right ballpark when coming to their own understanding of it. Matt studied political philosophy in school and appreciates the vagueness of the piece, and the fact that it is able to be so widely interpreted by others. This work was inked at Cherry Bomb Tattoo in Greenpoint, Brooklyn. Thanks to Matt for talking to me and letting me take a picture so late in the evening. On Saturday, September 8, I saw Heaven and Hell, with Queensryche and Alice Cooper at Jones Beach. Like Ozzfest, there were tattoos everywhere. 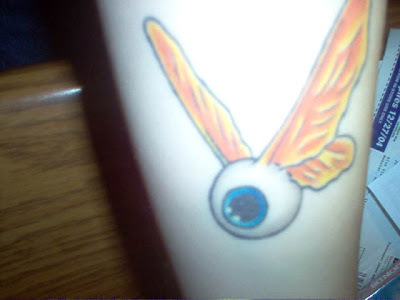 Like Ozzfest, asking people about their tattoos seemed to be inappropriate, dangerous (at times), and the epitome of dorkiness, especially since Tattoosday hadn't officially spun off yet. Like Ozzfest, the best I can do is offer candids, although I did get a great shot of one of my favorite's from the show. Basically, that's all I was able to get at the show. 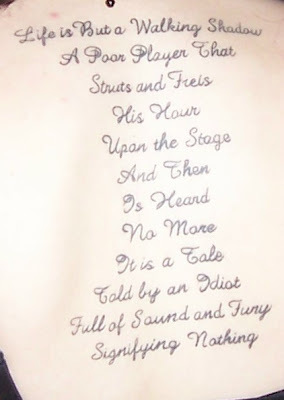 However, the Macbeth tattoo made it all worth it. I have no other concerts on the horizon, so that may be it for a while from the live music venues. 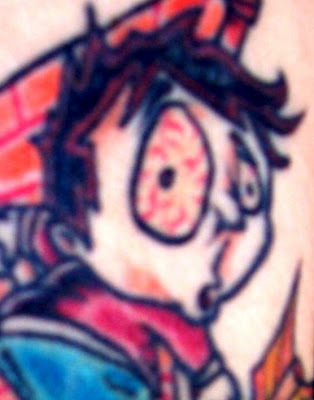 On the second anniversary of my blog, BillyBlog, I have decided to launch a spin-off, called Tattoosday. I originally intended for the Tattoosday concept to be a once a week feature, with posts every Tuesday (or Tat-Tuesday, if you will). I have copied my six Tatttoosday posts from BillyBlog over to this site for continuity purposes. My reasons for doing this are hazy. Primarily, I thought it would be easier to explain to people with tattoos that I had a blog called Tattoosday that featured them, as opposed to a blog called BillyBlog that had a weekly feature called Tattoosday. Simpler explanation, I think, if the blog is devoted solely to tattoos. There's also less pressure, I think, to find people. Instead of needing them by a certain day, I'll post them as I find them. I can also post other tattoo-related items here, if I see fit. 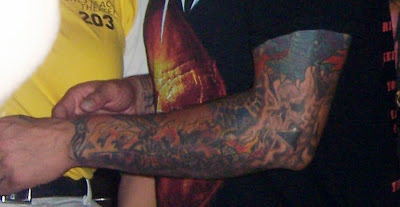 So even if you see posts dated prior to September 8, 2007, they are dated to correspond to the "Tattoosdays" when they appeared in July and August. Sorry for the delay in posting, I was worried I would have to improvise, but found two participants today. Last Friday I had my first rejection: a guy at 53rd and 6th Avenue sitting on a bench was the first person to decline. 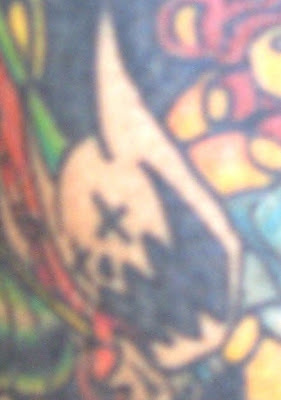 He had many colorful tats on both arms and seemed open at first, but was adverse to my taking any photographs. On Tattoosday Eve, Labor Day, I still had nothing for the post. I stopped someone in front of my building yesterday with a really cool Hellboy tattoo. He seemed receptive but wanted to check out the blog first. 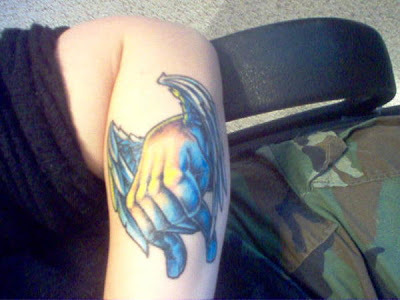 have seen a handful of dolphin tattoos like the one the Ancient One sent me. Today was the kids' first day of school, so I took off from work. Around 11 AM, I decided to ride my bike, eventually making it to Coney Island, where I guessed I could find some good ink. Yet it was still sparse, I had ridden down the Boardwalk and had circled back when I found my first subject. The Japanese characters spell out the woman's name, Fernanda. Unlike on the recently-aired episode of VH1's "Rock of Love," in which one of the contestant's gets Bret Michaels' name tattooed on the back of her neck, as a show of devotion, Fernanda has inked her own name. I see a lot of people that do their own names on their arms or legs (I work with many who have done so), and have never really understood the phenomenon. But in Fernanda's case, I get the artistic expression a little more. These are Japanese letters that have a greater aesthetic impact than Roman letters. When I asked Fernanda why she tattooed her name, she merely expressed that she loved Japanese letters and Japanese culture. She was born and raised in Brazil and has only been living in New York for a year. She did not remember the name of the shop where she had the tattoo done, but narrowed it down to the Astoria section of Queens for me. I have to agree, it's a pretty cool tattoo. I made another pass and headed back home. Once I made my way to the Shore Road promenade, where I do the majority of my cycling. I have several spots along the several-mile route from which I can head home. I decided to go down to the 92nd Street footbridge. Standing on the bridge was a gentleman who seemed to be cooling off from running. He had earbuds in and a large biceps piece. He also had an ankle piece and another tattoo on his triceps. He explained it a tribal Native American designed mixed with the American flag which he got as a tribute after 9/11. The piece was done by Craig Cooley at Abstract Tribal Tattooing in Brooklyn. I asked him if he was a fireman, and he said, "No, a police officer." I thought, with the 6th anniversary of September 11 just a week away, it was a perfect punctuation mark to end a week of tattoo-spotting, and begin a week of reflection on this somber anniversary. Thanks to Fernanda and Mike for their participation in this edition of Tattoosday!